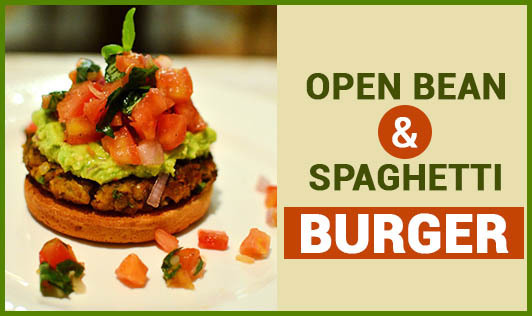 Made with crisp burger buns, assorted vegetables, beans and spaghetti, these tangy, lip-smacking bean burgers make a truly tempting snack. • Heat 1 tbsp of butter in a nonstick pan, add chopped onions, green chilies and sauté on medium flame for 1 to 2 minutes. • Add beans, vegetables, and tomato ketchup. • Mix well and cook for a minute. • Add the cooked spaghetti, mix well and cook on medium flame for a minute, while stirring occasionally. • Add salt, freshly-ground pepper. Mix well and cook on medium flame for 2 minutes, while stirring occasionally. • Divide the topping into 4 equal parts. • Cut the burger buns horizontally into halves. • Scoop out the center of the buns and brush each half with a little melted butter. • Preheat the oven to 200°C and bake for 10 minutes. • Fill the buns with the bean-spaghetti filling, top it up with white sauce, and some processed cheese. • Bake again for 5 to 10 minutes till the cheese melts.